Just Crafty Enough – Road to the State Fair ’16: Finally Done! Road to the State Fair ’16: Finally Done! 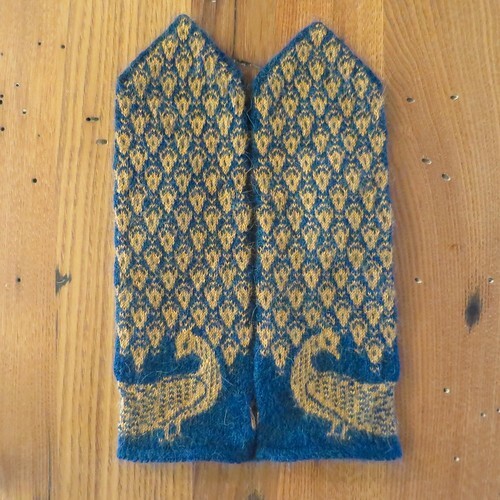 I’ve done it, I have finally finished these friggin’ mittens for the Minnesota State Fair (with days to spare to submit them). Don’t get me wrong, I love the pattern I came up with, I love the yarn and I love the finished mittens. I just struggled with knitting them for some reason. I wanted to use this beautiful dark blue/green because it is a very peacock-like color, but at a gauge of fifteen stitches per inch I had a really hard time seeing the separate stitches and kept dropping them. I spent a lot of time in my reading glasses picking up stitches that had fallen four or five rows back. I finally finished both hands and then it took me three tries to get a thumb design that I liked the look of. This meant lots of tinking back tiny, tiny stitches. I finished the first thumb, picked up the stitches for the second and realized that I had made two right mittens! At this point I almost gave up thinking there was no way I could finish on time. But I didn’t give up. I frogged back to thumb, moved it and reknit the whole top of the mitten. So now, they are still drying from a blocking. I’ll probably also steam them and manually tighten a few loose stitches before bringing them in for judging. 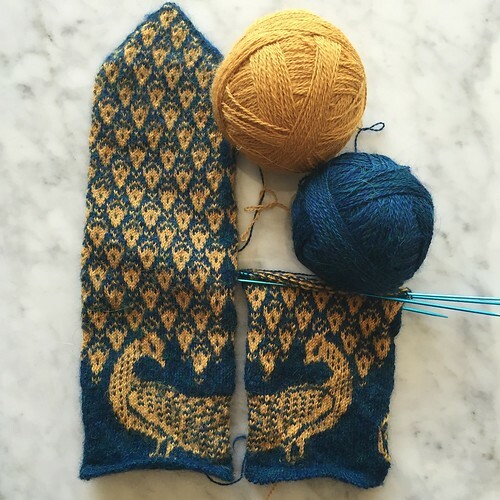 I have to say, I have never been so happy to finish a pair of mittens, ever. I am working on getting this pattern together to share, so look for it later in August. 3 years ago by Kat in Crafting with Kids , Knitting , Needlecraft | You can follow any responses to this entry through the RSS feed. You can leave a response, or trackback from your own site. 14 Comments to Road to the State Fair ’16: Finally Done! I hope you win this year! I’ve seen your previous entries, and they all were beautiful. But these are really extra special. They look beautiful! I really love the colors you chose. I hope you win!! I will look for them this year when we go to the fair. Thanks Natalie! If you go on opening day come say hi to me at the Knitters’ Guild Booth in the Creative Arts building. I also believe these are very beautiful. 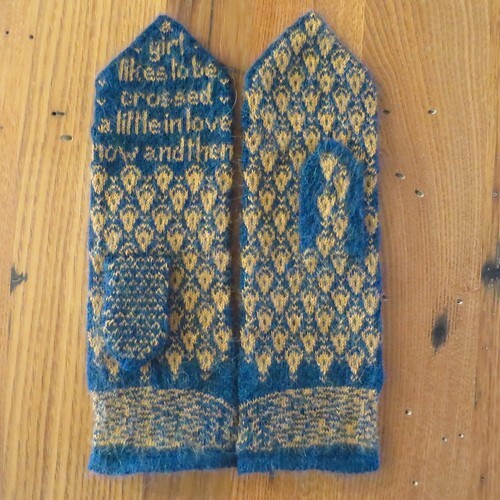 Honestly I don’t think I’ve ever seen such lovely gloves before. I think that has to do with the color! Great job, Kat! I think I might make it to the fair this year so I’m looking forward to seeing the blue ribbon next to your work! Thank you. I thought the colors of this yarn was amazing! Wow!! Beautiful doesn’t seem adequate! The only word that comes to mind is …….SUPERCALIFRAGILISTICEXPIALIDOCIOUS….! What an extraordinary work of art. You have earned first place at the fair. Such patience you have!